WINNERS OF THE 2017 YA BOOK AWARDS!!!! Hi guys, Today I will be sharing with you guys the winners of 2017's YA Book Awards! I know, I know, you guys are probably thinking, Delaney, you should've had this post out like a month ago, but I was just so busy and I wanted to give more time for those few people who went in after the New Year to vote, so I am finally showing the winners today! 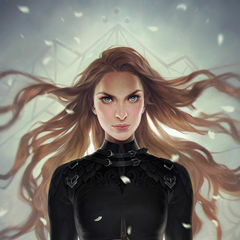 FEYRE ARCHERON! Credit to this amazing artist! I know, big surprise, right? Yes, Feyre did take the lead over Emma Carstairs who was a close second! RHYSAND! Credit to this amazing artist, truly impeccable work! Yes, our dear Rhysand won by a landslide, nobody else stood a chance.